Kenn Thompson’s daughter Ashley saw a contest, submitted a picture of the room in his basement dubbed Area 51 and an essay about how she thought he was the biggest super fan of the NFL in Canada. He was up against 3,000 other super fans across the country, he was shortlisted but was the panel’s unanimous choice. 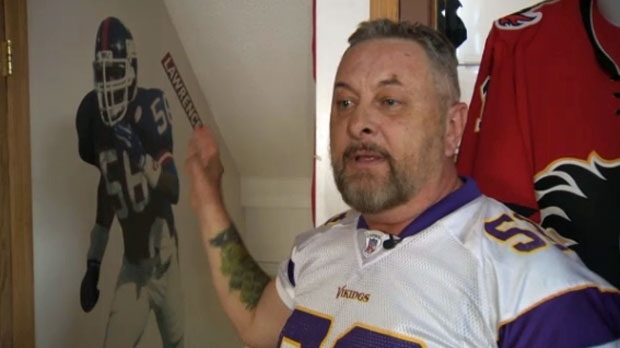 Thompson had no idea what was going on until he got a Facetime video with Adam Thielen, wide receiver with the Minnesota Vikings; which just happens to be his favourite NFL team. “I was so shocked and so surprised I couldn’t talk, I couldn’t think. He said I’ve got a surprise for you. He says I’ve got two Super Bowl tickets, all expenses paid to Atlanta. That’s when I completely lost my mind. It was the coolest thing just getting the Facetime from Adam Thielin but then he tops it off with Super Bowl tickets. I’ve never experienced anything like that in my life,” says Thompson. Thompson says Atlanta was a great experience joking the weather was a lot better than it is here. Saturday, Thompson attended the NFL experience and met the people with NFL Canada but Super Bowl Sunday is something he’ll never forget. When it comes to being the league’s number one Canadian fan- he says getting used to it. “I think it’s just one of the coolest things in the world. I’m the number on super fan in all of Canada. As Adam Thielen said ‘I think we chose the right person.’ It’s a great endorsement,” says Thompson. He said it’s been a lot of attention which has been cool and fun for his daughter and the rest of his family. 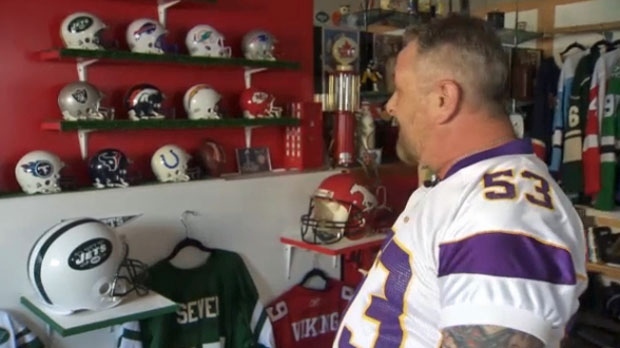 Thompson’s collection stated with a few mini helmets and a couple of jerseys but when he and his wife, Gina moved into their home he decided he’d like to build his room in the basement and credits Gina for helping him keep everything in order. “There are times when I want to change a few things but I like and when my son-in-law says ‘ You're drowning in football here’ I knew I’d made it,” says Thompson. Thompson has over 70 NFL jerseys in his room but the new highlight is a signed football and gloves from the Vikings Adam Thielen.